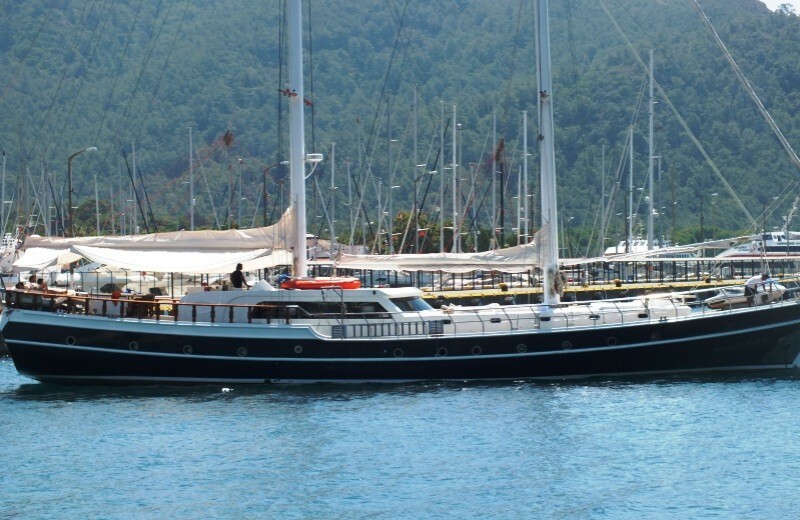 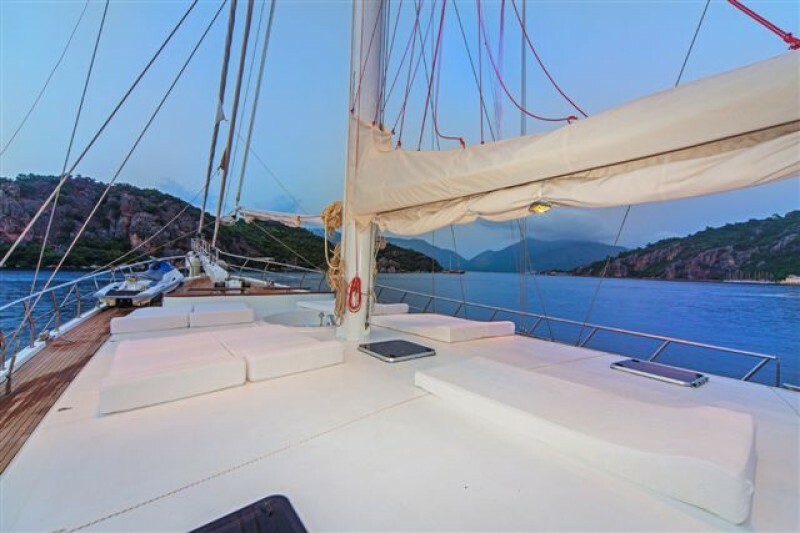 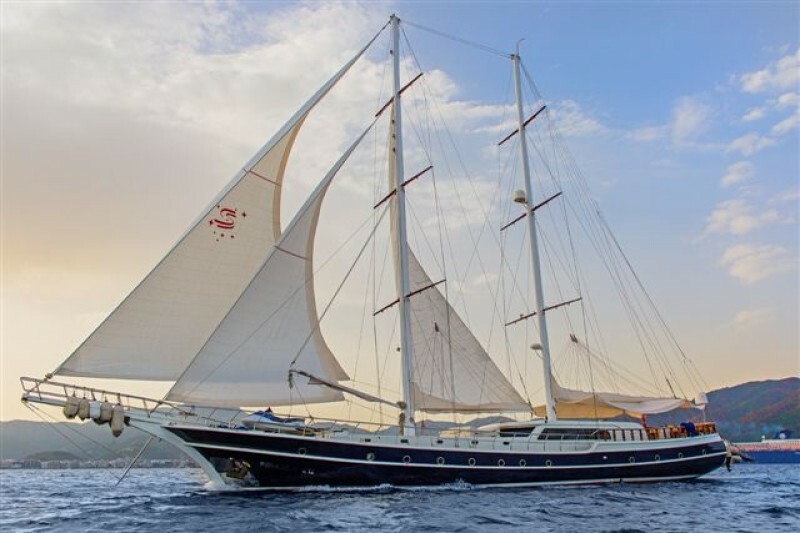 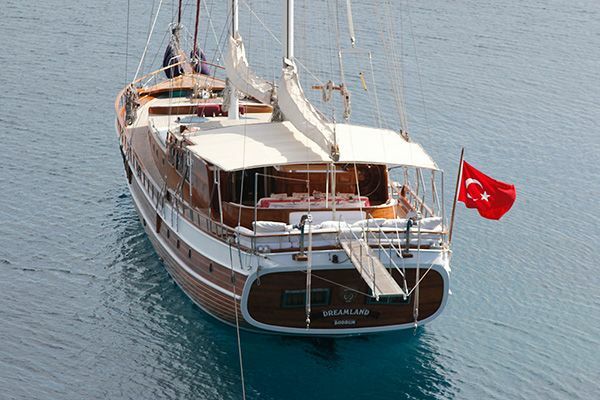 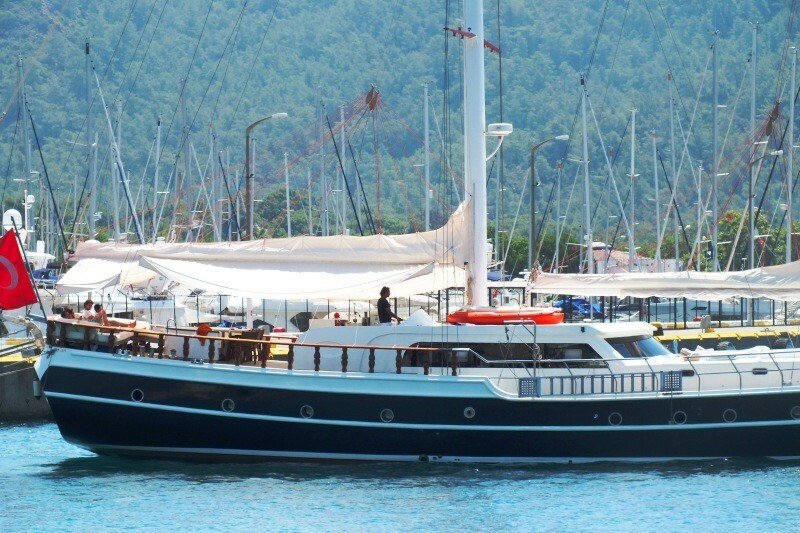 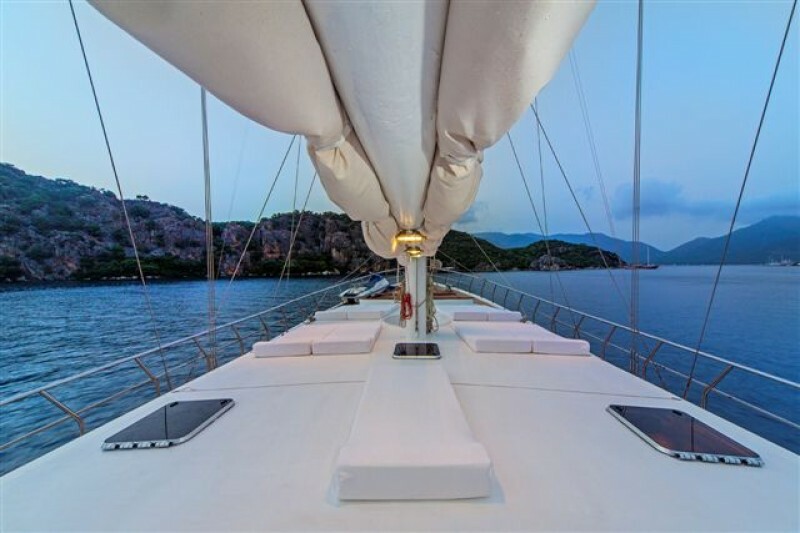 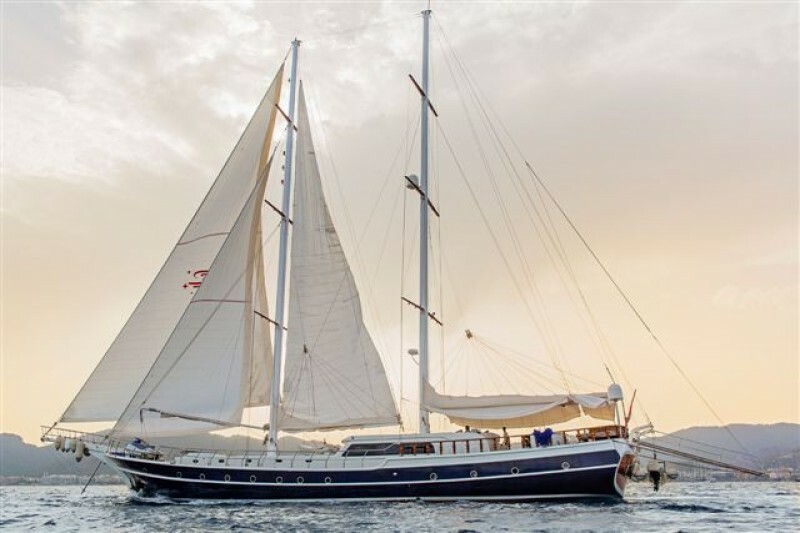 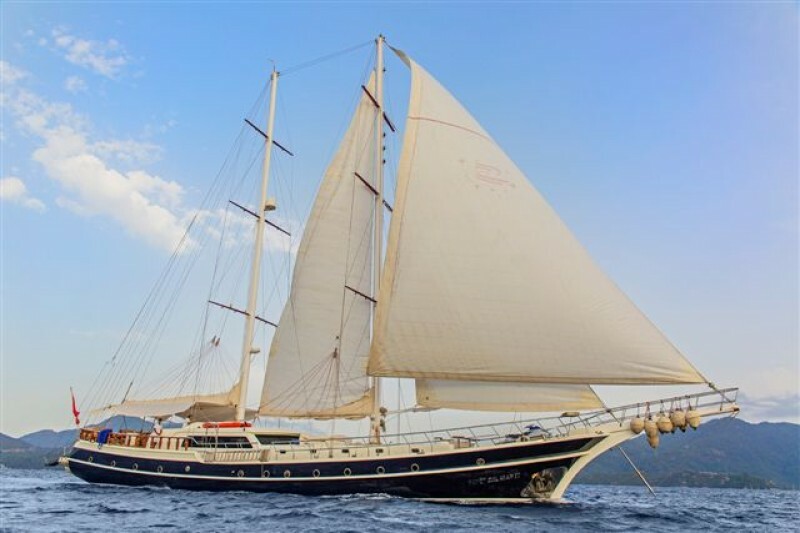 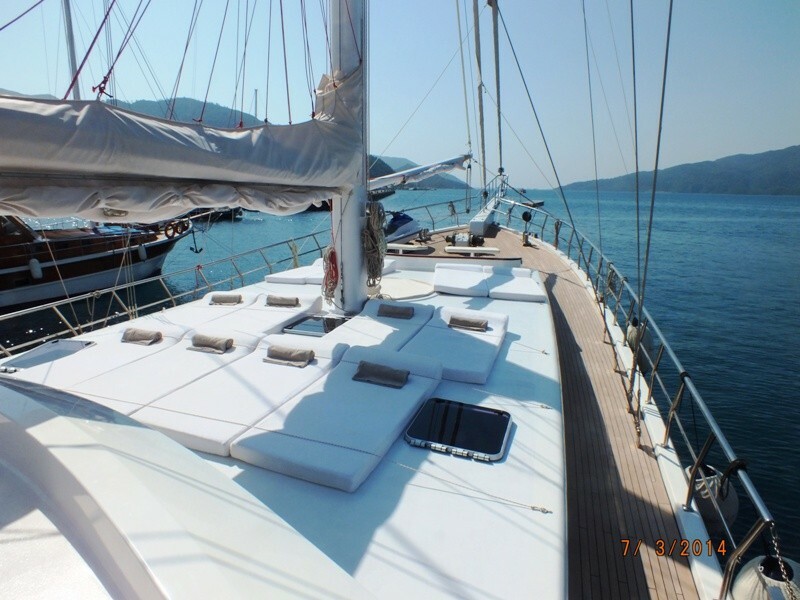 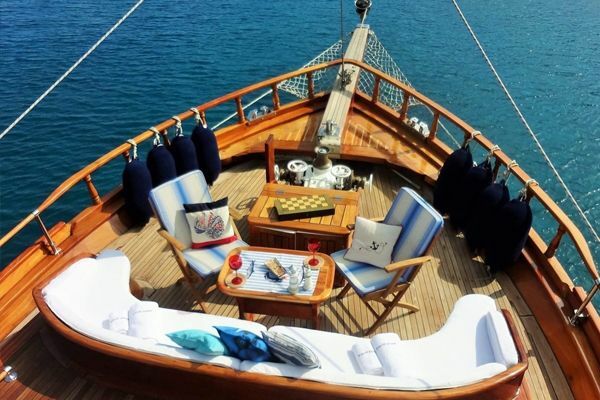 Choose the elegant ketch Perla Del Mar 2 to properly relax on a deluxe gulet holiday cruise on the Turkish Mediterranean coast and the Greek Island of Rhodes. 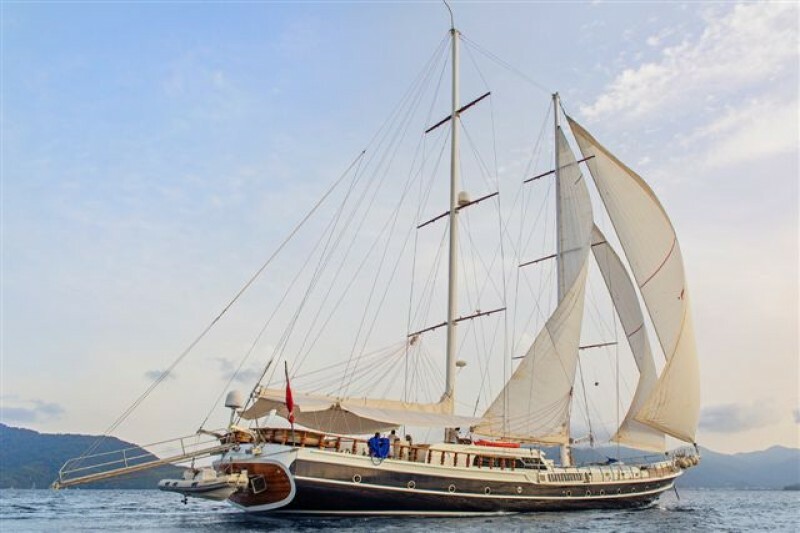 The pleasing line of the classic wooden hull has been designed to take it under sail over the water, while the sumptuous interior is designed to pamper guests. 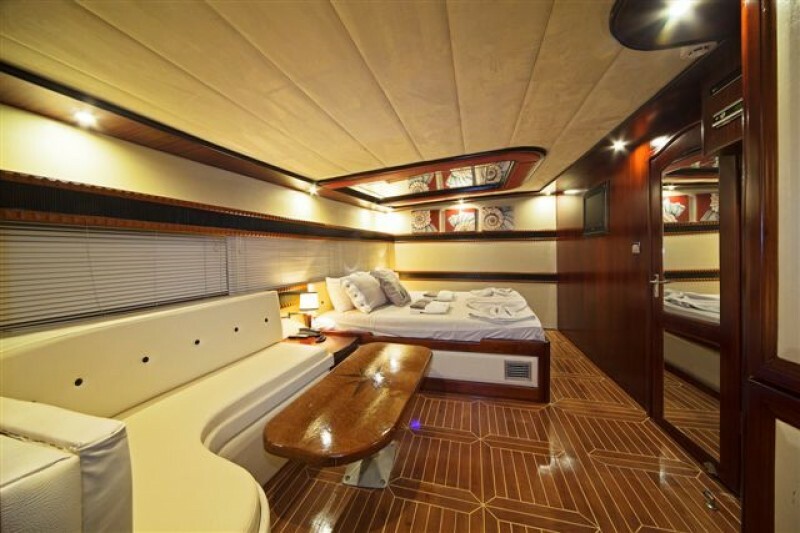 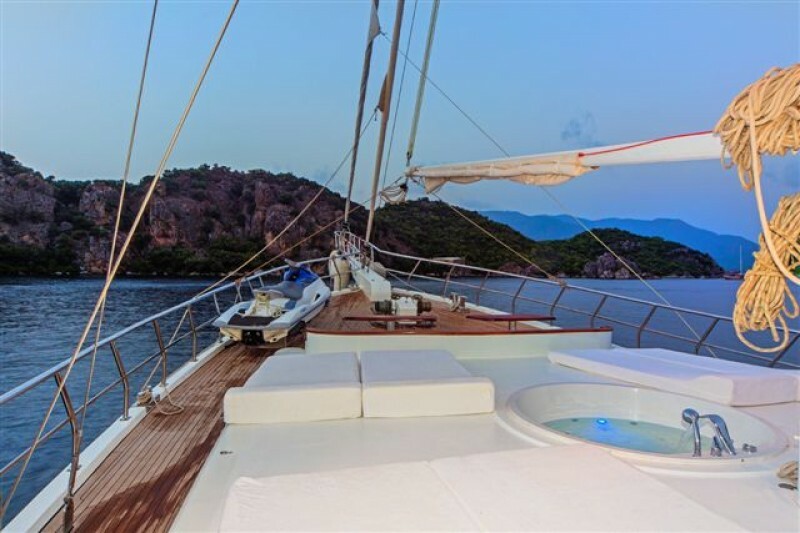 The two master suite cabins on luxury gulet Perla Del Mar 2 , one with its own jacuzzi, enjoy the space of the whole width of the beam fore and aft. 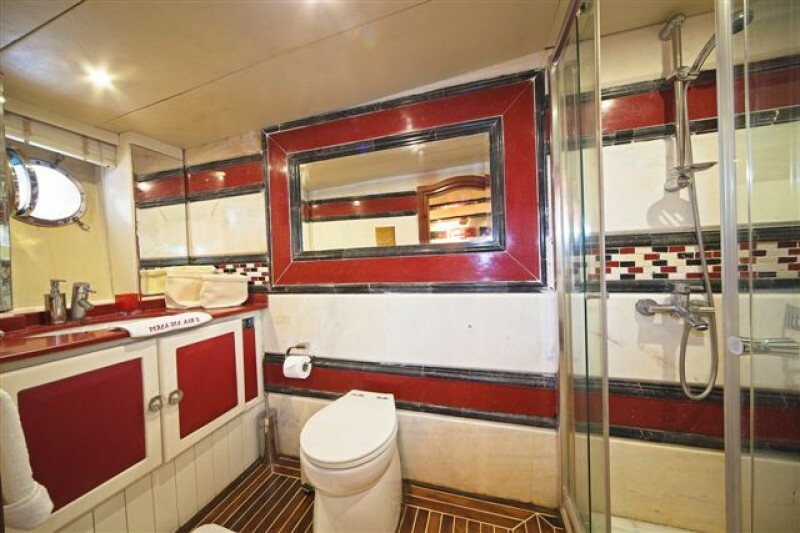 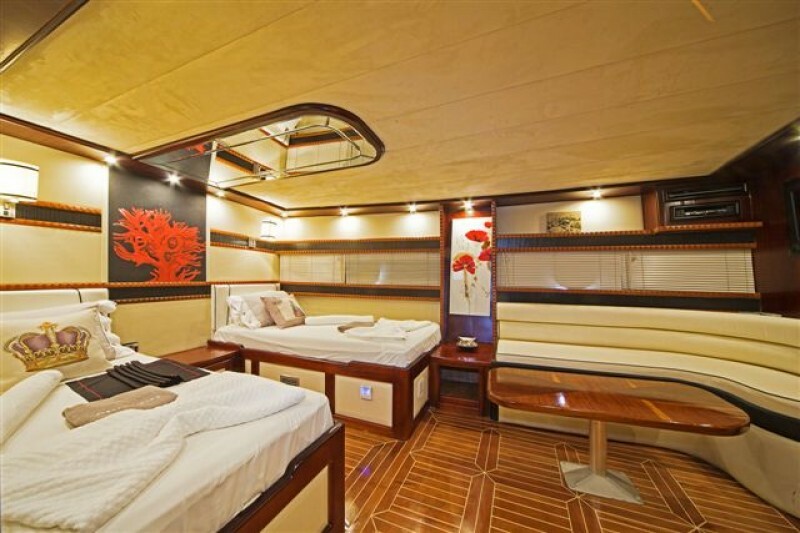 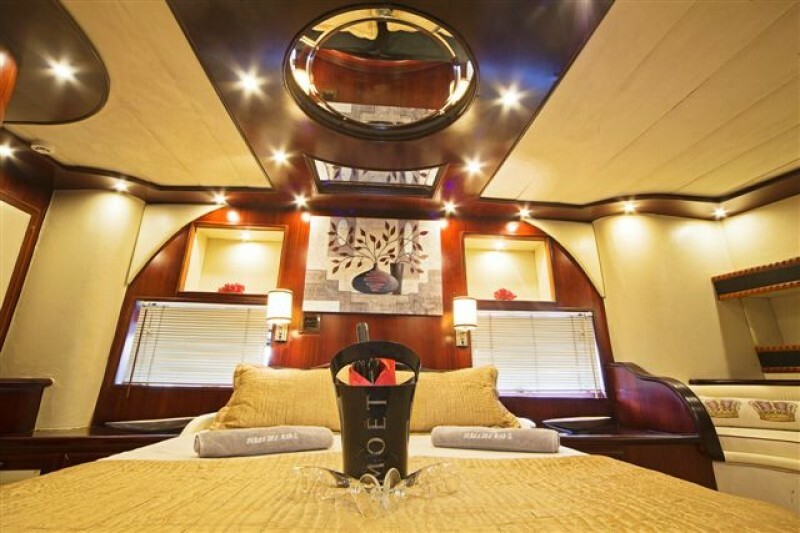 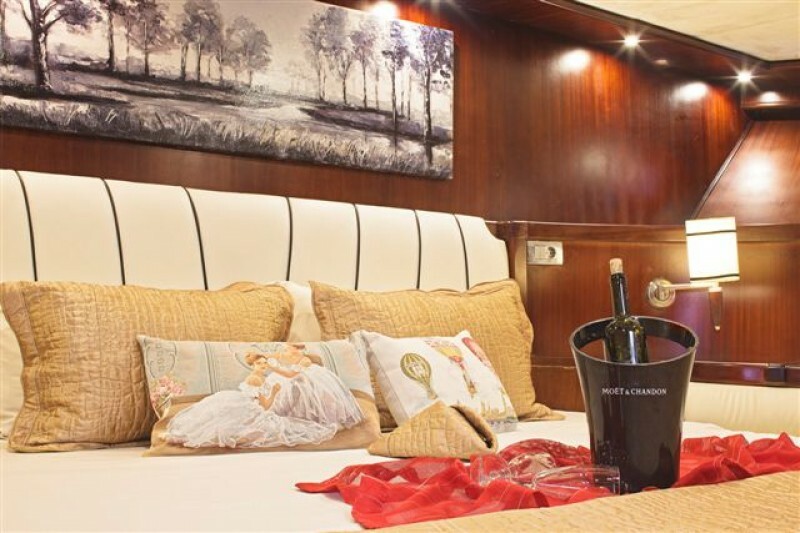 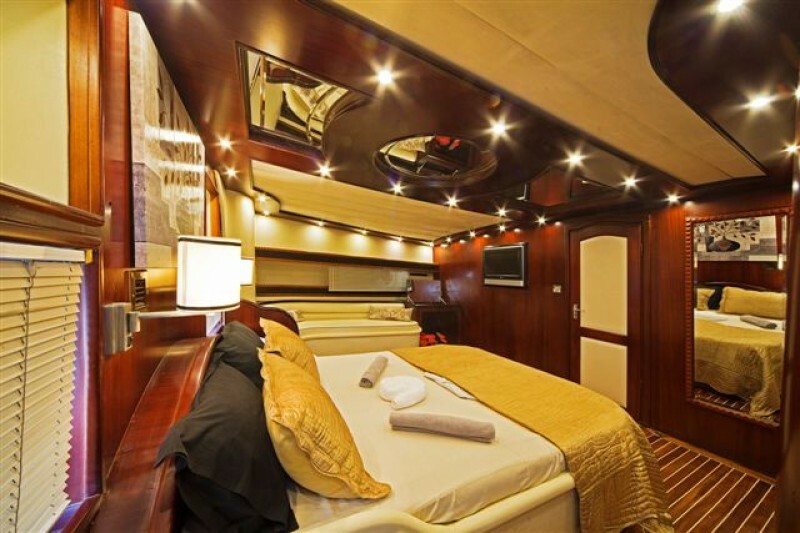 All cabins have modern bathrooms and fittings, luxuriously comfortable double and single beds with extra touches such as comfortable headboards, thick towels and bathrobes. 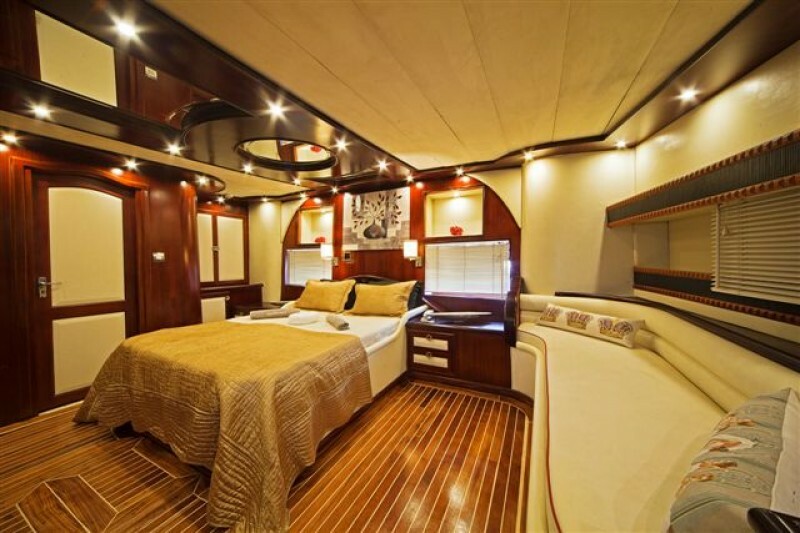 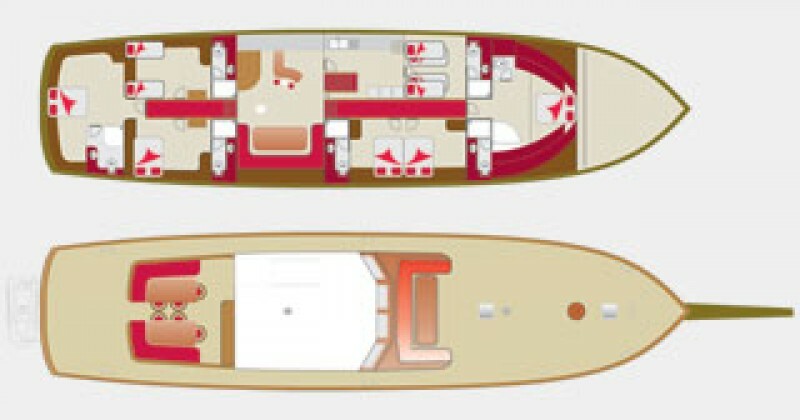 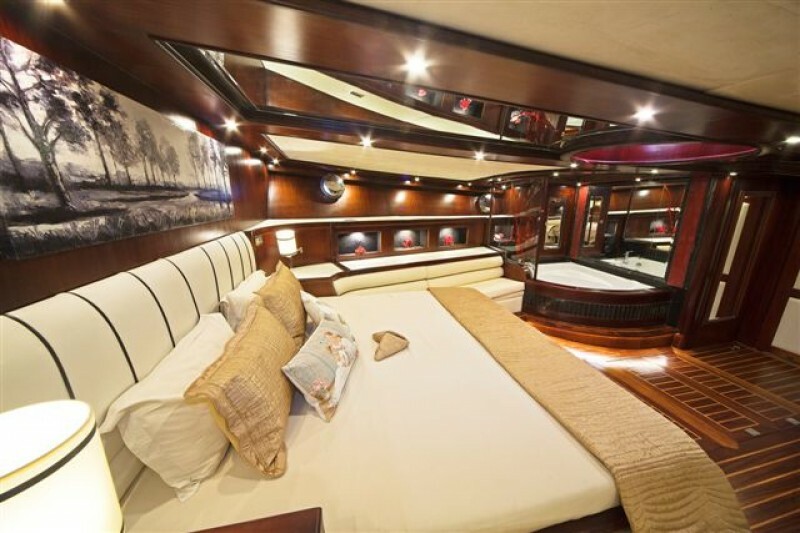 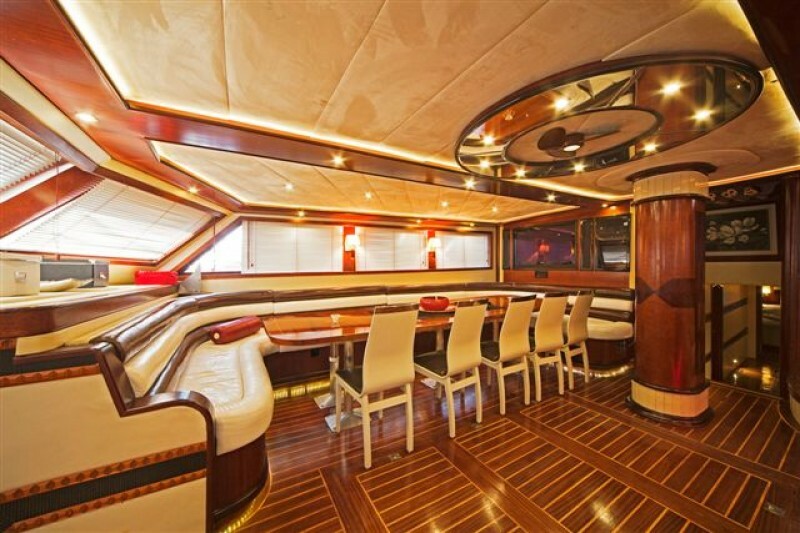 The signature design of this style ketch has two groups of twin-double cabins divided between fore and aft sections, each side below the saloon dining, bar and galley, which gives a party of up to twelve guests space to enjoy privacy and comfort on deck and below. 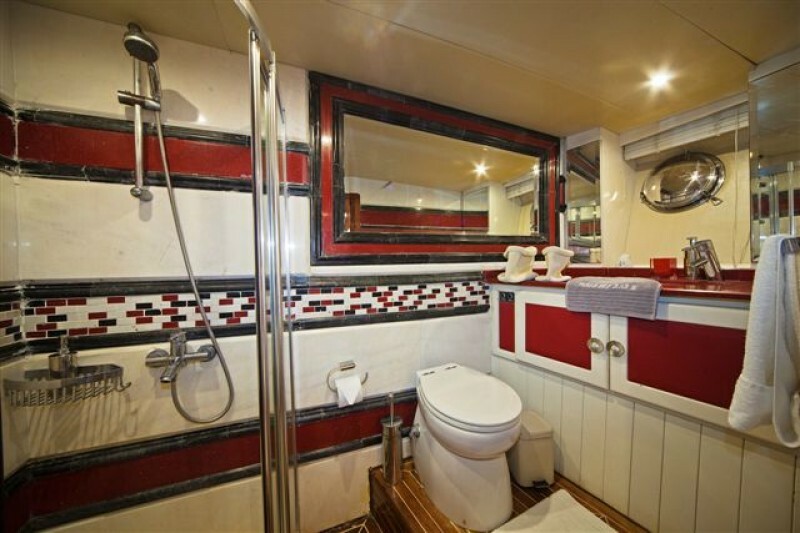 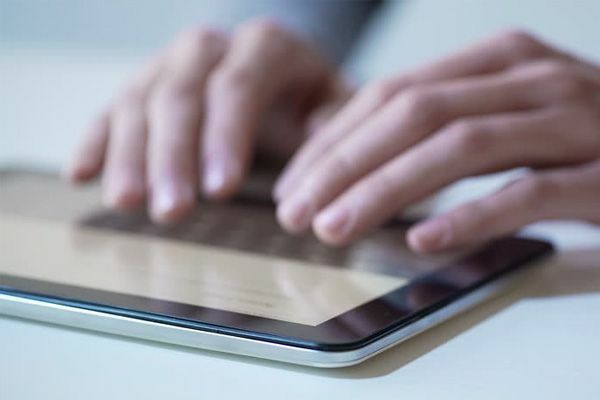 Each of the well- appointed cabins has a bathroom, TV, and air-conditioning. 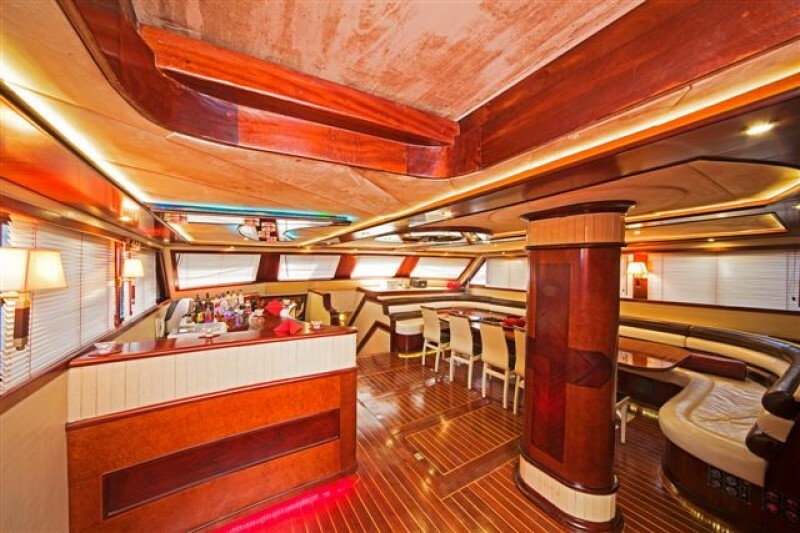 With a long banquette couch and a dining table the air-conditioned saloon is an ideal alternative spot for meals or relaxing. 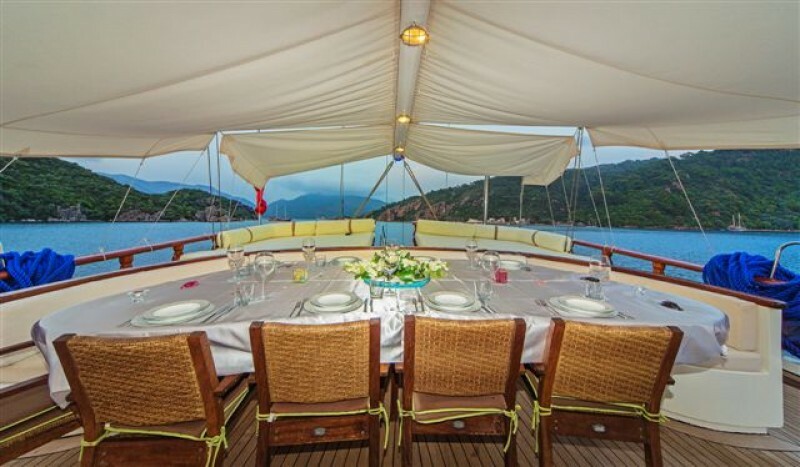 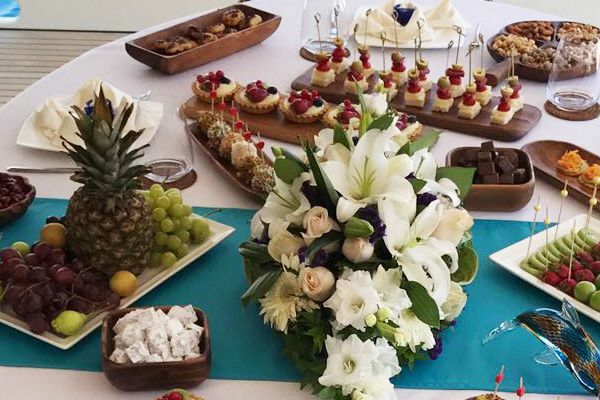 The spacious aft deck on yacht Perla Del Mar 2 gives the pleasure of dining al fresco, enjoying delicious Turkish foods produced daily in the galley, while relaxing with a sundowner drink at the end of the day at the bow table on cushions is too good to miss. 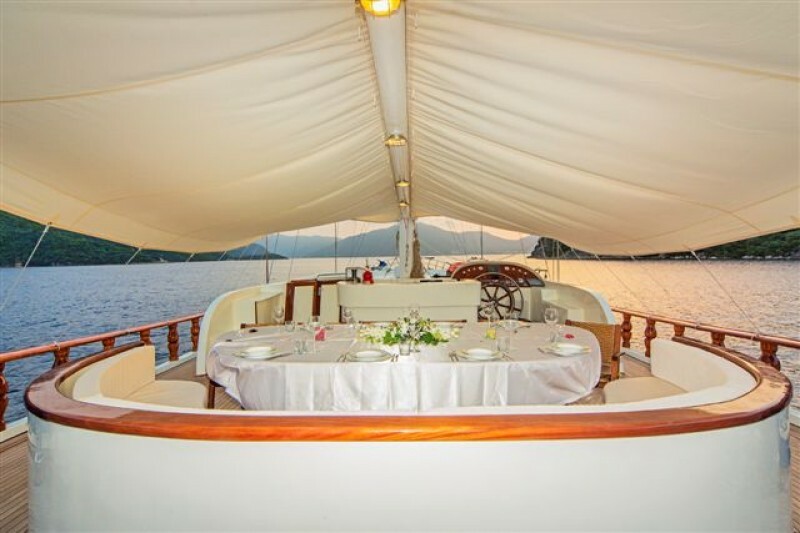 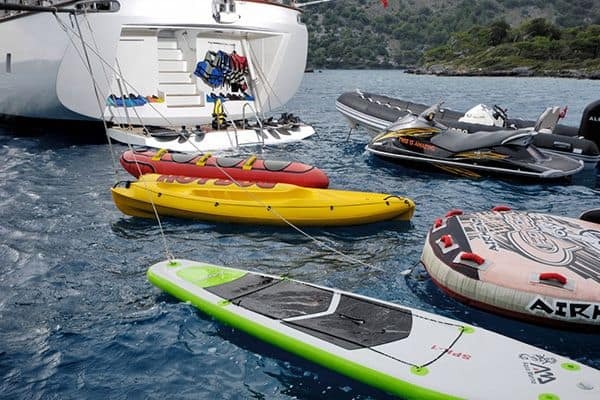 Cushioned areas on fore and aft decks allow for catching the sun or the shade, while the turquoise clear water beckons the swimmers who can also enjoy the canoe and snorkels provided aboard, or the water toys if requested. 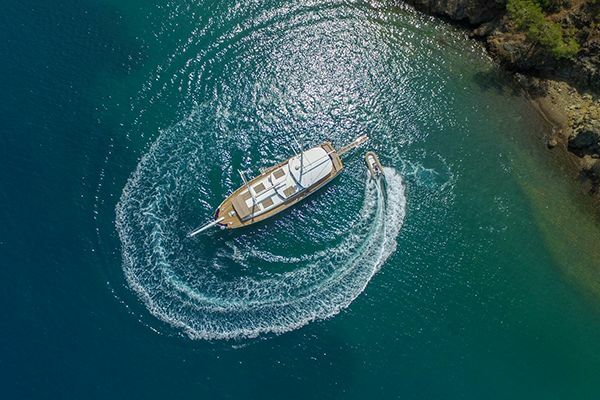 The space of the elegant 36 metre gullet Perla Del Mar 2 is ideal to be enjoyed by guests who want to be pampered by the professional crew of five and the captain, who knows where to explore the incredible bays and little coves on the Mediterranean coast and nearby Greek Islands.